Project Veritas released a new undercover video on Nov. 27 showing employees at The Washington Post explaining the publication’s bias against President Donald Trump, and revealing the influence of Amazon CEO Jeff Bezos, who purchased the news outlet for $250 million in 2013. The video is part of the ongoing “American Pravda” series from Project Veritas to investigate bias and conflicts of interest in legacy news outlets. It follows videos in which CNN staff said the networks’s reporting on the Russia investigations was all about ratings, and videos in which New York Times staff said bias against Trump was part of the company culture. The exposé on the Washington Post begins with Dan Lamothe, a national security reporter at the paper, telling an undercover reporter that there are two camps at the news outlet when it comes to political coverage. On the news side, he said, the reporters are typically trying to be critical of Trump, but “also give him credit where there’s credit.” Yet, on the editorial side, he said, the “Washington Post institutional voice” has a strong and open bias. “Those have become critical to the point where I’ll read some of them and I’m like whoa! Like I work for this place?” Lamothe said. Lamothe described it as “a very different mission,” and also noted the publication is criticized for sensationalizing certain topics, such as Hurricane Irma, while avoiding issues that affect everybody, such as political policy. “I can’t tell you how many times we get an email at work: ‘Oh did you see what he just tweeted? What are we gonna do about it? '” he said. The second half of the video features an undercover video of Joey Marburger, director of production at the Washington Post, who explained some of the influence owner Bezos has had on the publication. Among the key points he revealed was that when the Washington Post changed its tagline to “Democracy Dies in Darkness” shortly after the elections, the phrase was selected by Bezos. 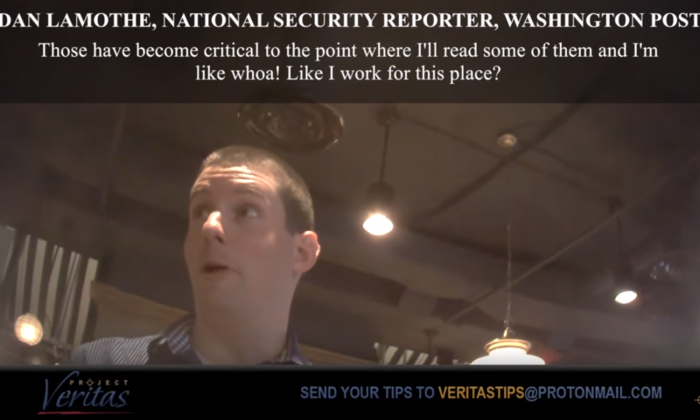 The Washington Post caught wind of the Project Veritas investigations, and published its own video and article ahead of the release, adopting some of the same methods involving hidden cameras used by Project Veritas. A woman who allegedly worked for Project Veritas as an undercover reporter approached the Washington Post with false claims that she was impregnated as a teenager by Roy Moore, a candidate in the Alabama senate elections. The false claims are similar to claims published by the Washington Post, which are still unproven. The Washington Post said the woman, who used the name Jaime Phillips, had inconsistencies in her story and had made previous posts on the internet that made them question her intentions. It also alleged that Washington Post reporters saw the woman walk into the New York offices of Project Veritas. “The reason why the media investigations we’re doing are so important is because the media arguably has more power than Congress—it has more power than the legislature. It informs the culture,” he said. O’Keefe later approached the Washington Post reporters with his own camera to ask questions, which resulted in both sides briefly attempting to interview the other. The video exposing the Washington Post is the first in a series that Project Veritas plans to release on the company.